Many people think that networking during a job search means calling everyone you know and asking them for a job. They associate networking with being pushy, overbearing and an overall pest. People often shy away from networking because they don't want to be labeled as this type of person. But research shows that 70-80 percent of all jobs are filled through networking. Successful networkers show a sincere interest in their networking contacts. They work hard to develop a relationship, establish their credibility and share information. Below are seven rules to follow for successful networking. 1. Don't ask for a job, ask for information. "Joe, as you know, I most recently worked for a medical device company in their marketing group. I know that you've been in pharmaceutical sales for the past 15 years and I'm very interested in learning more about marketing roles within your industry. I don't expect you to know of any open positions in your organization, but I'd like the opportunity to speak with you briefly to learn more about your organization and the pharmaceutical industry in general." Joe may think, "OK, here's a friend that wants some information and sees me as some sort of expert on the topic. That's kind of flattering. I guess I could spend a few minutes with him." Does Joe know you're looking for a job? Probably. But you are not asking him for a job; you're just asking him for advice and insight. The stakes are low and the expectations are reasonable, so he is more likely to help you. 2. Don't take up too much of the other person's time. A reminder of who referred you and perhaps some brief chit-chat about that mutual acquaintance. A statement up front that you have no reason to believe Mary can offer you a position and a reiteration of why Mary's information is of interest to you. An explanation of your agenda. "Today I'd like to tell you a bit about myself and get your perspective on the future of the high-tech industry." Remember to discuss your skills and accomplishments and show how you can add value to an organization. By planning your meeting ahead of time, you establish your professionalism, gain credibility, and cover all the critical agenda items. 3. Give the other person a chance to speak. Ask questions. When you network it is imperative that you do not do all the talking. If you have asked another person for advice, make sure they have the opportunity to offer it. Also, when you do all the talking, the other person might feel confused and unsure of what they are supposed to do with the information you have supplied. Here are some questions you can ask to keep your exchange balanced and establish rapport. How long have you been with this company/field? What do you like/dislike about your job? What type of training do you need for positions such as yours? What is the culture of this company and what are its guiding principles? 4. Ask for suggestions on how to expand your network. One of the main goals of networking is to tap into the network of the people you are meeting with. Each person you meet knows 200 or more people. 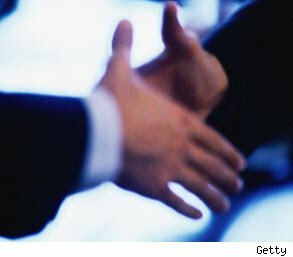 If you can gain introductions to some of them, you quickly increase your network and your chances of finding the right connection. Ask your contacts if they can recommend a professional organization or the names of some other people you should be talking to. 5. Create a vehicle for follow-up. If you want to establish rapport with another person, you need to create ways to keep the relationship going. Ask the person if you may keep them informed of your search progress. If you read an article that pertains to a discussion you had at a networking meeting, cut it out and send it to them with a brief note. Try to find at least two to three opportunities per year to reconnect with members of your network. 6. Find ways to reciprocate. Building a network is about creating a genuine, caring relationship. Thank your contact for the information they have supplied and see if you can help them in some way. Maybe your contact is interested in living in an area that you are familiar with or has a child interested in attending the same school you just graduated from. Share your knowledge of the school and your experience there as a way to help the other person. Keep notes on what you learn about your contacts so that future correspondence can have a personalized touch, such as, "How was Jane's first year of school?" 7. Send a thank you letter. Always thank your contacts in person and follow up with a letter. If your handwriting is legible, the personalized touch is always appreciated. Networking is an ongoing process. It requires persistence, attention, organization and good will. Incorporate the art of networking into your job search campaign now, and you will gain opportunities and build relationships that will last a lifetime.